CHATTANOOGA, TN -- (Marketwire) -- 02/21/12 -- Spring is just around the corner, and so is America's pastime. One of the most popular events in the Southeast is the Amateur Athletic Union (AAU) Baseball Super Regional Championship, March 2-4, 2012 -- and the Residence Inn Chattanooga Near Hamilton Place is proud to offer comfortable accommodations for players, coaches, and families. As one of the largest non-profit volunteer sports organizations in the United States, the AAU is a multi-sport organization dedicated exclusively to the promotion and development of amateur sports and physical fitness programs. Central to all the tournament activities, the Residence Inn is the perfect Chattanooga, TN meeting space for teams and fans. Recently named the "Best Hotel in Chattanooga" by the Destination Guide, the hotel is also close to local corporate headquarters, great attractions and entertainment. 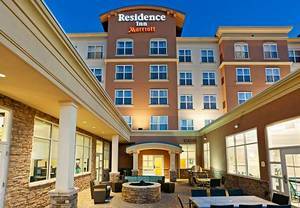 Among business hotels in Chattanooga, TN, the Residence Inn is next to the new conference center and minutes from Hamilton Place's shopping and entertainment. When looking for suite hotels near Raccoon Mountain, guests will find first-class service and great amenities. When it comes to hotel deals, Chattanooga, TN's Residence Inn is hard to beat. Last-minute weekend rates start as low as $149/night*, and other special savings can be found at http://www.marriott.com/hotels/hotel-deals/chahp-residence-inn-chattanooga-near-hamilton-place. For more information on the tournament, guests can visit http://aaubaseball.org/District/SoutheasternDistrict.aspx. *Availability will be confirmed at time of booking. Lowest advertised rate may not be available. Advance booking required. Rates valid for Friday and Saturday night stays only. Two-night minimum stay may be required. Rates are per room, per night, based on single occupancy. Taxes, resort fees, and incidental charges are additional. Rates may not apply to groups of 10 or more rooms and cannot be combined with any other offer or discount. Additional restrictions may apply. When choosing among Chattanooga extended stay hotels, guests will find first-class service and great amenities, including a Level 2 Electronic Vehicle Charging Station. The Residence Inn's 109 suites on 5 floors feature full kitchens, flat-screen TVs, luxury bedding, free Internet & grocery shopping service. The hotel also offers 3 meeting rooms with 4,650 sq. ft. of total meeting space.